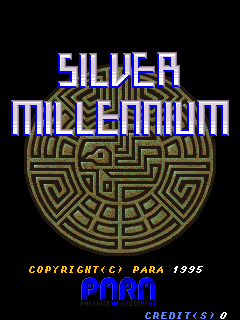 Silver Millennium by Para has sat on the MAME ‘Most Wanted’ list for a while now, but always seems to sell for Crazy Prices. 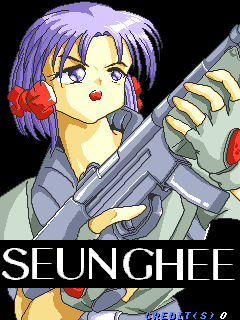 Running on hardware which I’ve found is derived from Tumble Pop bootlegs much like ‘Cross Pang’ and ‘Bestri’ from F2 System, this Korean shooter appears to be an original game developed in Korea. The actual hardware looks just like any other cheap Korean game, so we were rather lucky when Bonky0013 found out he had a PCB of it and dumped it! As mentioned, in recent times when it sells it usually sells for crazy prices (>$1000) and production values are higher than most Korean games, although not THAT high, maybe there is some history behind the game causing the high prices which I’m unaware of. That said it is known to have been listed for $200 back in 2007 without selling at all, so either people have decided it’s a lot rarer in the past 5 years, or caught some kind of Millennium bug ;-) It’s possible the reserve price on the $200 one was just a lot higher tho. The game has ‘adult’ content, although I’m not sure when it gets shown or if it requires a dipswitch change like the language does. 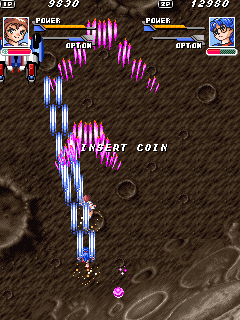 Images can be viewed in the test mode. 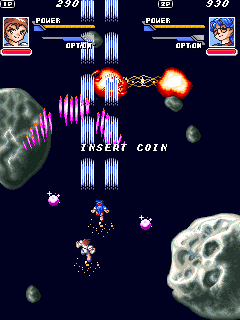 The game mechanics are closer to older shooters, with fast aimed bullets, although instead of a lives system the game features an energy bar which is depleted near instantly if you hit a big swarm of bullets. I’ve done a video of the gameplay from MAME in which you can see the intro, complete with hilariously bad translated text and footage of the first two levels. Hardware doesn’t do transparency effects, images are flickered on/off per frame, the game does this a lot when the various girls appear midlevel and such. The video above makes it look transparent as a real monitor would because I’ve frameblended it to 30fps for optimal YouTube viewing. The sound unfortunately isn’t great, the YM2151 at least allows for proper music, but the rest of the sound samples are played through an OKI6295, and the quality of them leaves a lot to be desired. Clocks are not verified, nor is the framerate / refresh rate of the game or the overall audio balance. 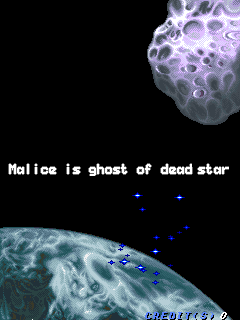 So much for all those silly scientists who told us we were made of stardust…it was MALICE! Glad to see this rare game finally dumped and emulated. Well done Haze to have written so fast a driver for it ! Concerning framerate / refresh rate of the game or the overall audio balance, i will ask Bonky0013. Most Korean games (pre-Hyperstone) borrow hardware designs from other manufacturers, even if they implement them in their own generic chips. For sound systems 99% of the Korean games will use a Z80 and M6295 (AD-65) chips, if you’re lucky you’ll get a YM2151 or 3812 thrown in. Older ones tended to be an AY8910, and MSM5205s for samples. Basically they mirror bootleg hardware very closely using the cheapest parts. Keeping these things in mind and looking at the initial memory map accesses, number of valid interrupts etc. 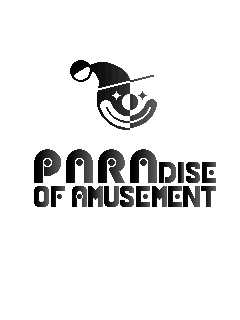 gives you a pretty big head start when it comes to emulating Korean platforms. Only a couple are an absolute pain in the backside, Suna and Suna-related stuff especially due to excessive amounts of banking, rom scrambling, and wacky video systems which seem to be derived from more complex Seta/Taito designs but never identical. 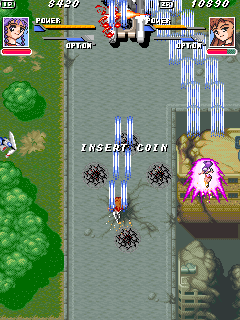 This shoot em up seems to me a prequel of the great Shikigami no Shiro (TaitoGNET). 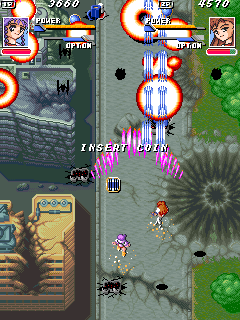 Aswell as Shikigami no Shiro, this also has the same ‘flying person’ shooter style as ESP Ra.De & Espgaluda.